Can You Imagine How Nice It Would Be to Have a Porch? For just an unhurried moment, imagine the time you'll enjoy spending on your porch. Envision the books you might read on your porch swing. Hear the birds chattering in the trees and allow yourself a bit of personal time. Porches are good for the soul. 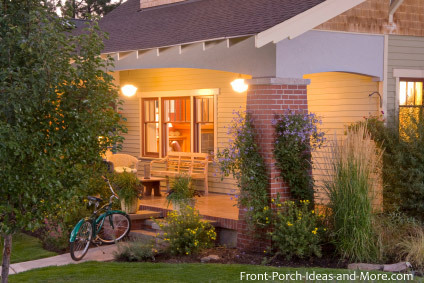 Begin first with the Front Porch Ideas Generator, our eBook. But why? Because we don't want you to say, "I wish I would have thought of that." In our book, we feature ten homes whose homeowners would love a porch. We show you these homes "before" pictures. Then we show you conceptual "after pictures" that an architect drew up of how their homes would look with a new porch. And wow, what a nice difference in each of these homes. You'll see not only welcoming porches but also the porch steps, walkways, roofs, and landscaping too. Things you maybe haven't considered in your porch planning. Save yourself from disappointment by seeing these possibilities for your own porch. 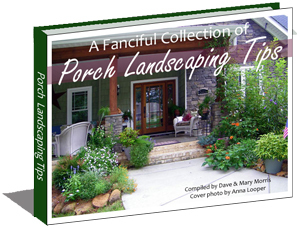 Our ebook can help you think through things and feel more confident in your porch planning. See how the "before" goes from blah to pizzazz! "If Only I Had Thought of THAT!" Dave and I often get comments from our readers about how they wished their porch would be - larger, more accommodating for their lifestyle, more private, shadier and the list goes on. Don't go to all the expense and trouble of building a porch and then upon completion say to yourself, "If only I had thought of THAT". While we don't guarantee our 140-page picture filled eBook will help you think of every detail, we do promise it will help you to cover the bases by giving you ten "before and after" case studies from which to learn. Whether your home style is like these homes or not, you can apply these ideas to your own home to create your perfect porch. A place where you will love to spend time. A place your neighbors will envy. Question: Will I be able to see how a porch looks on MY house? Answer: This ebook will show you many styles of homes (of real homeowners) and various porch and roof configurations that the landscape architect drew for them. While it won't be your home, we think it will spark ideas - not only for porch and patio designs but also for walkways and landscaping. If you already have a porch and want to expand it, you'll find ideas for that too. We include commentary to explain and narrate the pictures. The porches in our eBook range from small porticos to large wraparound porches. Even a screened porch is included. The before and after pictures reveal dramatic differences to enhance your imagination. Question: Is this book available in print? Answer: This is an eBook and is not available in print. 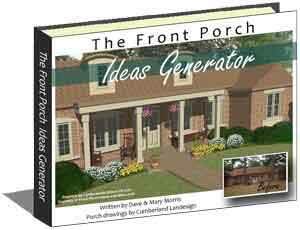 The Front Porch Ideas Generator eBook and our two bonuses are PDF files that you can download immediately to your computer. Once you download them, you can refer to them anytime you choose. The Front Porch Ideas Generator makes a significant contribution to three areas of interest we have pursued for over 30 years - front porches and their decoration, skillful home makeovers, and whole yard landscaping. The before and after photos and graphics alone make this a very worthwhile read for anyone interested in porches and the positive impact they can have on any style home. "However, it's your instructive commentary at each case study that really sets The Front Porch Ideas Generator apart as an extremely insightful book for all porch lovers! Congratulations and thank you. Your Front Porch Ideas Generator is awesome! It would definitely convince me to add a porch (if I didn't have one) and it's amazing how it shows what a huge difference a porch makes. I couldn't believe the transformations! You really gave lots of great examples for so many styles of homes. This book should really be helpful for anyone who may be considering adding a porch to their home. 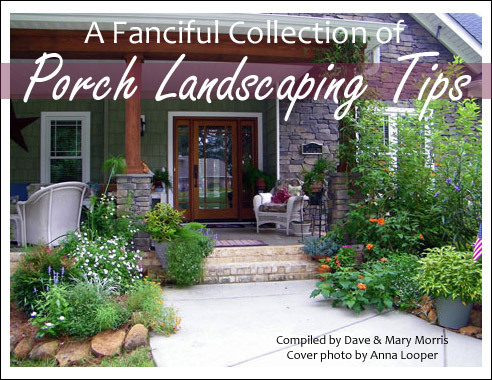 You will also receive our "Fanciful Collection of Porch Landscaping Tips". This mini eBook is a compilation of eclectic gardening ideas from several well-known gardening authors. Anna Looper - freelance garden and travel writer - shares pictures of her amazing North Carolina Craftsman style porch with us. You will enjoy Anna's whimsical flower garden that surrounds her gracious front porch. Debra Lee Baldwin - garden photo journalist, artist and author - shows you how succulents can be used to create a deliciously beautiful container garden for your porch. Rebecca Sweet and Susan Morrison - California-based writers, garden designers and friends - share ideas for using interesting foliage and textures around your porch with vertical gardening. 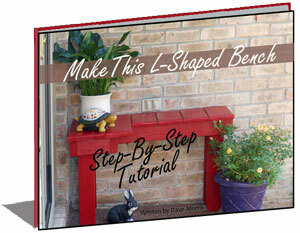 You will also receive our step-by-step tutorial for making our "Handy L-Shaped Bench". 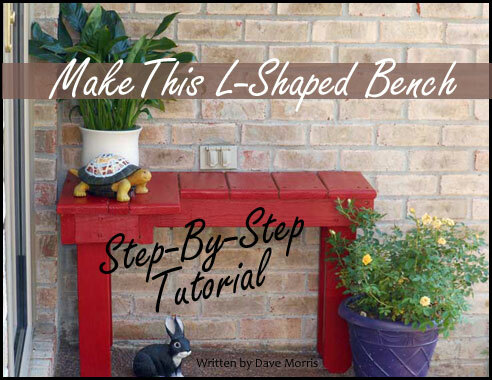 Get our step-by-step instructions for making this bench - including helpful pictures to illustrate the steps. This is a fun weekend project. Make this handy and attractive little bench for your porch or as a welcoming gift. Immediately after your purchase, you can download your eBook (and two bonus eBooks) and dig into these ideas we show you. 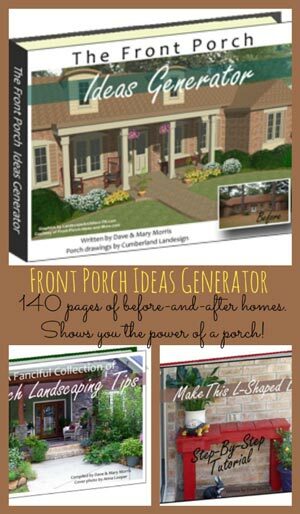 The Front Porch Ideas Generator eBook and our two bonuses are PDF files that you can download immediately to your computer. They are not a physical product. If your computer doesn't have the Adobe Reader software, you can easily install it for free. The Front Porch Ideas Generator comes with a 100% guarantee: If you are not satisfied with it, just contact us within 60 days of your date of purchase - and we'll issue you a 100% refund with no questions asked. Your eBook purchase is 100% safe and secure - and 100% risk-free. If you get just ONE idea from our Front Porch Ideas Generator to create a porch that you love, you'll be repaid in years of enjoyment. Reclaim your home's charm and gain usable space with a welcoming porch. DISCLAIMER: The purpose of this ebook (and our bonuses) is to educate, inform and generate ideas. The reader assumes responsibility for the use of this information. The reader's individual results may vary from those shown.